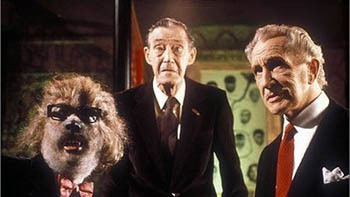 Before he scored a huge hit on the 1980s pop charts with “Thriller,” Vincent Price experimented with the early new wave scene in the 1981 anthology horror film The Monster Club. It could seriously be called The New Wave Monster Club! 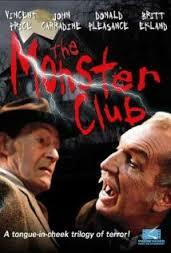 Vincent, a vampire, meets John Carradine, a horror writer, on the street and invites him to a party at The Monster Club. Sure, you can consider this the wraparound story, but the real focus between stories is the full length performances of new wave songs by obscure bands that never made it big on the new wave scene…while a bunch of monsters at the club dance along. Now this is how you start off the 80s! The soundtrack includes songs by B.A. Robertson (who had a trio of albums in the early 80s), Night, The Viewers, The Expressos (who also released a full-length album), a band called The Pretty Things, which had been releasing albums since the 1960s, and even an early track by UB40 (but they don’t appear in the movie). And there are some great songs for your Halloween playlist. The Viewers do “Monsters Rule OK.” B.A. Robertson does “Sucker for Your Love” (his new wave vampire appearance in the film rox). The Pretty Things do “The Monster Club.” The trick is trying to find this soundtrack. It may have been available on vinyl ages ago, but it never made it to CD. However, in a bizarre turn of events, one of the earlier releases of the DVD includes the entire soundtrack ON the DVD. Don’t ask me why they couldn’t have made the soundtrack a bonus CD. But if you want the soundtrack, hunt down the DVD with this cover and you’ll be able to listen to it through your DVD player. As for the movie, Vincent Price is at his devilish best. And the three stories get progressively better. The first one is about a couple that hatches a plot to steal from the mansion of a weird, very pale man. The only real horror fun here is when we see what becomes of the woman at the end. The second story involves a little boy who discovers a scary truth about his father, who is being hunted by a slayer played by Donald Pleasence! The twist in this tale is a total winner and puts Pleasence in a rather comical situation for a change. Finally, the third story has a man looking for a location to shoot his movie. He comes to a creepy town and is soon being terrorized by the locals—a bunch of fricking ghouls! The illustrated book he finds in a church is super eerie. Love this one. And it all ends with a big new wave dance party back at the Monster Club. And you thought Night Train to Terror was the only new wave music video horror anthology. 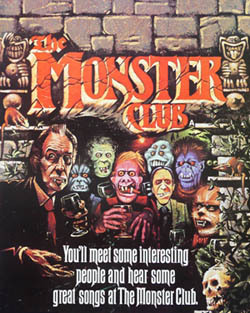 This entry was posted in Living in the 80s - forever, Movie Times & Television Schedules - Staying Entertained, Sound Check - The Songs Stuck in My Head, The Evil of the Thriller - Everything Horror and tagged 1980s, 80s, horror anthology, The Monster Club, Vincent Price. Bookmark the permalink.